With years spent reading single issues here and there, juggling storylines of dozens of titles, I decided it was time to find a better way to read comics. So, it was off to the back issue bins armed with the longest want list you’ve ever seen! Putting together series after series and reading them in their complete goodness, I was reborn as the Retro-Reader! The Skunk is a muscle-bound super hero with super-strength and an ability to produce incredibly forceful flatulence! On patrol in New York City, he rescues a young woman named Macy from the Sticky-Boys. The two become quickly inseparable, and Macy dons a costume to join the Skunk as his sidekick (although she doesn’t have any powers). They manage to halt the Roll‘s plan to gain control of NYC’s toilet paper roll supply and then embark on trips to the country, the golf course, and other places where the Skunk unwittingly defeats thieves, aliens and other dastardly villains. The Bad: Despite lasting for six issues, nothing really happens. There’s little to no character development and no real mysteries or questions are raised (except for the landlord with the x-ray vision). the Good: Bill Maus‘ artwork is his strength. Macy’s got a sleek look to her and the Skunk has a cool, hulking physique. There’s plenty of silly action here to keep it light and fun! The Verdict: If you’re looking for fun, high-energy action with very nice artwork (and a side of flatulence) … then this is the comic for you! However, if characterization is your cup of tea, then you should move along to another part of the comic store (perhaps towards the Waiting Place or Strangers in Paradise). Bud Plant has played a notable part in comics history. In the 1970s, he opened a comic store called Comics & Comix and he also published underground comix, most notably Jack Katz‘ First Kingdom. A decade later, his company, Alternate Realities, was a major distributor of comics on the West Coast, which he later sold off to Diamond Distributors (currently the only major distributor of comics). But, before all that, his imagination was captured by Stan Lee & Jack Kirby’s run on Thor, Marvel’s version of the Norse god of thunder. 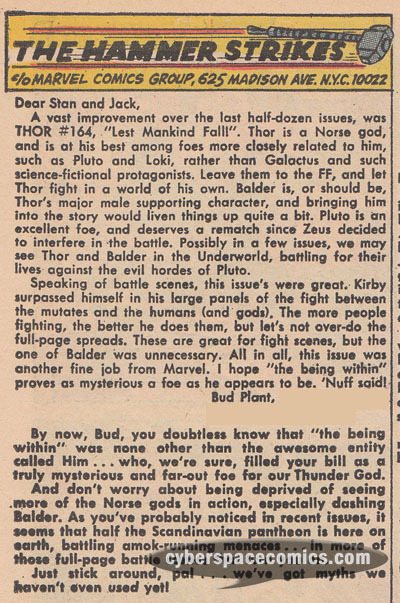 He got a letter published in Thor #169 (cover date – October 1969), which you can read below. I find it worth noting that his letter, which suggests that the creators leave Galactus to books like Fantastic Four, was printed in an issue prominently featuring that very same character! 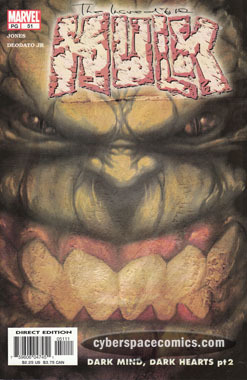 During the speculator boom in the 1990s comic book market, publishers enhanced comic covers to increase sales. These gimmicks included shiny foil, holograms and even pop-ups! But, one of the coolest enhancements was the glow in the dark cover. Let’s shed some light on the subject, shall we? Marvel’s “new” Ghost Rider (Danny Ketch) proved to be even more popular than the original! His series debuted in the early 1990s and went on to spawn several spinoff titles which were collectively known as the Midnight Sons. Issue 15 featured what I believe to be the earliest glow-in-the-dark comic cover. The issue pictured here is actually the second printing (note the gold background) but, if you manage to get your hands on a first printing (black background) … don’t you worry! … ’cause that one glows, too. After looking at hundreds of comic book covers, it becomes quickly apparent that not every cover is 100% original. Whether done intentionally or even underhandedly, there’s something about uncovering these “swipes” that adds a new element of fun to reading and collecting comics. 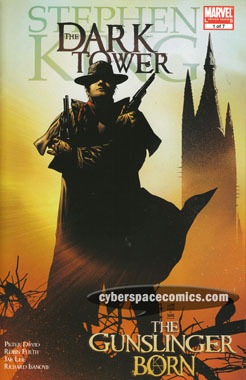 Stephen King’s Dark Tower series of novels has an enormous following, so it was with much excitement that Marvel Comics acquired the license to publish comics based upon the books. The writing chores for the series were confidently handed over to Peter David. 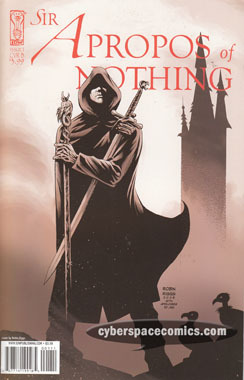 And, a year and half later, when IDW published a comic series based on David’s Sir Apropos of Nothing series, it seemed only fitting that the cover pay homage to the cover of the first Dark Tower comic. When the DC and Marvel Universes merged in Marvel vs DC, a new one was created: the Amalgam Universe. This one-shot combined Wonder Woman and Storm of the X-Men into one concept. 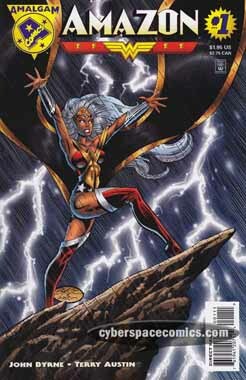 Princess Ororo of Themyscira is a weather-controlling mutant who was orphaned at a young age in a shipwreck. She was found and raised by Amazons who, years later, selected her to bear the mantle of Wonder Woman. Now, the being who killed her father intends to do the same to her. But, can even an mutant Amazon defeat Poseidon? Byrne pits our heroine against quite the heavy-hitter in this tale, all the while revealing her origin through flashbacks. The book is heavy on word balloons and thought bubbles but it’s not at all tedious to read. The art is undeniably Byrne’s work … the worst part of which is that I think he has a difficult time drawing girls with attractive faces. 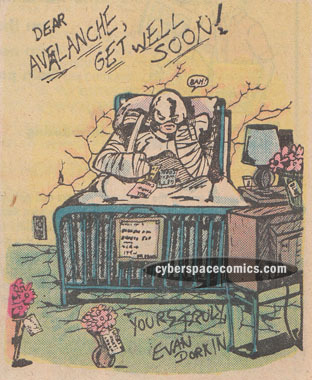 Interestingly enough, he wrote this comic as if it were part of an ongoing series (a practice that was executed in all the Amalgam books – they even went so far as to write a fake letters page and “next issue” box) and even goes so far as to set up a subplot (albeit briefly) involving a wounded Diana Prince that will never be resolved. However, it’s got me curious and I would certainly read the next issue … if it were ever published. And, that’s the sign of a good read! Twenty years after the first movie came out, 88MPH published this four issue mini series written by Andrew Dabb with art by Steve Kurth. Curiously enough, it’s set six months after the film and also in the year 2004. Therefore, it retcons the events of the movie so that they’ve happened in late 2003 or early 2004. Who knows where this places the events of the second movie, then! With that being said, the Ghostbusters are now famous, having saved the world from Gozer (who was incarnated on Earth in the body of a giant Stay Puft Marshmallow Man … oh c’mon … you remember all this!) and Louis is cashing in on his connection to Ghostbusters fame as well as his brief time spent possessed by the Terror Dog, Vinz Clortho. The Ghostbusters have gained some credibility, although there are plenty of New Yorkers who still think they’re a hoax. Egon‘s continuing to study the paranormal beings they capture, Winston‘s still with the team, Peter is continuing to court Dana Barrett and Ray is wallowing in self-doubt, wondering if the things they’ve discovered will have the desired positive effect on the world. In other words, things are quite status quo for the Ghostbusters. Status quo, that is, until they discover ghosts with lower-than-normal “brain activity” which leads Egon to believe they’re being controlled by something … or someone. Turns out, it’s someone. Michael Draverhaven, to be exact! “Who? !” you might ask … well, it turns out that Mike attended graduate school with Egon, Pete and Ray and assisted them in some of their earlier expirements with the paranormal. One such experiment led to a bad mishap which drove Michael into an insane asylum. It also granted him the ability to communicate with the ghosts. Newly freed from the asylum and utilizing the symbiotic relationship he’s formed with the ghosts, Michael concerts a paranormal attack on New York City as well as the Ghostbusters. 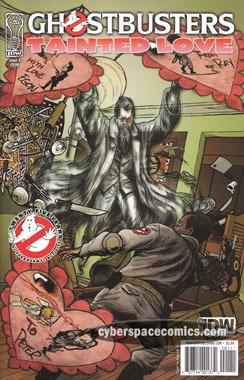 While the other three Ghostbusters are dealing with the havok the ghosts are creating, it’s Ray Stantz that takes down Michael and, with the leading mind behind their attack dispatched, the ghosts disperse and abandon their “mission”. This series proudly carries on the traditions set forth in the first film with its great sense of adventure mixed with humor. The “voices” of the characters and their interactions are spot-on, specifically Venkman (played by Bill Murray) and Egon (played by Harold Ramis). The continuity is very tight with the first film, there’s a Slimer cameo and there’s even a fun poke at Egon’s silly hairstyle from the cartoon series (what more could a Ghostbusters fan ask for?). 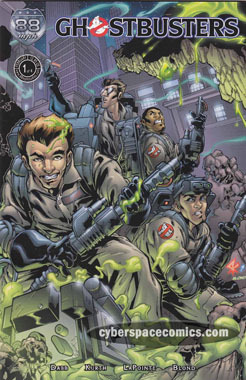 The art is incredibly slick and the coloring job makes it easily the best-looking Ghosbusters book … even to date! This book puts the more recent IDW series to shame. It’s too bad that this publisher never put out the ongoing series that was advertised in the back of issue #4. Unfortunately, since this publisher was so small and the book was met with some delays while it was being published, these issues are very hard to find. And, for you trade fans, you’ve got even more work cut out for you. 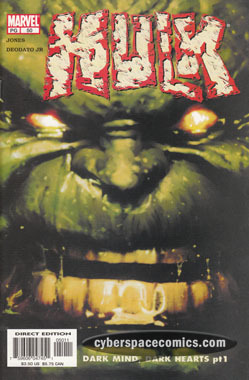 A trade paperback was indeed published … but it was only released in the United Kingdom. On the upside, fans of variant covers have 13 different covers to look for as well as a convention special that features an all-new solo story starring Winston. Jim Krueger is the writer behind Marvel’s greatest alterniverse epic, the Earth X Trilogy. After completing that massive saga, consisting of over sixty issues, he’s recently launched Project: Superpowers alongside Alex Ross at Dynamite Entertainment. But, years before all that, he was a fan of Rom, a comic book title published by Marvel Comics based on a robotic toy made by Parker Brothers. He got a letter published in Rom #52 (cover date – March 1984), which you can read below. 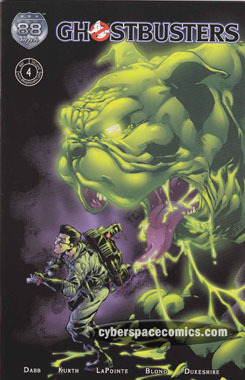 Kaare Andrews devised these back-to-back face shots of the Abomination and the Hulk to kick off an all-new storyline called Dark Minds, Dark Hearts that pitted the two gamma-irradiated monsters against each other. When the Ghostbusters capture spirits that are terrorizing the scene of an upcoming Valentine’s Day school dance, Winston meets a pretty substitute teacher named Tiyah Clarke, who thinks she has ghost problems of her own. Smitten with the young woman, Winston decides to loan her his ghostbusting services, free of charge. But, can he get rid of the ghost, who seems to be smitten with her, without using his proton pack? And, more importantly, will all this derring-do lead to a date? Dara’s plot makes for a nice Valentine’s Day one-shot read however, the lettering is a bit distracting. It almost seems like it was lifted from an underground comic with its inconsistent look and wobbly word-balloons. That and the sub-par artwork detracted from the book. However, the artist does have a pretty decent handle on portraying Egon and Peter so that they’re at least recognizable (his Ray and Winston, on the other hand, still need a lot of work). I really wish IDW would give their Ghostbusters series some better talent since none of their offerings have yet to stand out from the crowd.